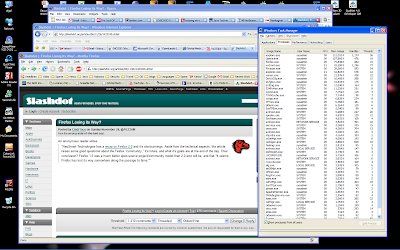 The genesis of this post goes back over a month, to November 26th, when Slashdot reported about an article "The NeoSmart Files" published titled "Firefox 2.0 Recap". The author complained about the new theme (too ugly for his tastes), the first-run website (too ugly again) and RSS support (too poor for his tastes). All those flaws just seemed to ruin his day. So I bookmarked that article for future comment (in Firefox 2, of course) and then installed Opera 9. I'd already upgraded to IE7 and Firefox 2. 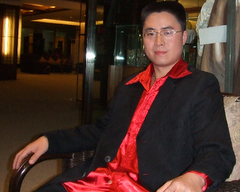 Then I spent the past month extensively using Firefox and Opera, with some limited use of IE7. The screenshot below shows all three browsers running on Windows XP SP2, with a shot of Windows Task Manager showing the memory footprint of all three browsers. I'd opened up all the browsers and loaded them up with multiple pages in multiple tabs, and then I'd let them sit and 'cook' for a while, moving around from site to site to let them soak up even more system memory. Why a memory check? Because I've heard more gripes about Firefox's penchant for using 'too much' memory. I've been using the browsers over the past month, especially Firefox and Opera, on both Windows as well as Linux. From a work-a-day perspective I can't find any real faults with all three on Windows, or Firefox and Opera on Linux. That even includes memory usage. You would look at Windows Task Manager and conclude that Firefox has the smallest footprint, but you'd be wrong. The right answer is that all three browsers consume the same amount of memory if operated long enough. The typical browser footprint (from my usage) is between 100 to 150MB with multiple open tabs. That's with Yahoo, Google Mail, CNN, YouTube, and other AJAX-enabled sites running in their own tab. My personal favorite is Firefox 2.0, the very same version that everybody wants to take potshots at. It runs the plugins are essential to me; Adblock Plus and Adblock Filterset.G. Why are they imporant? 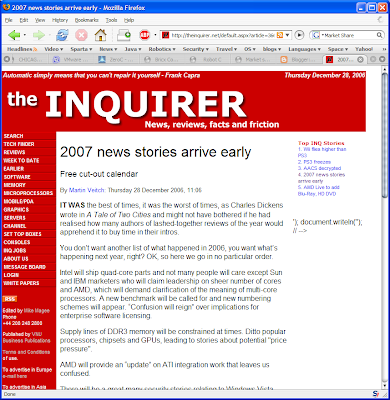 Let me answer by way of an example; TheInquirer as rendered by a browser without ad blocking, and one with. 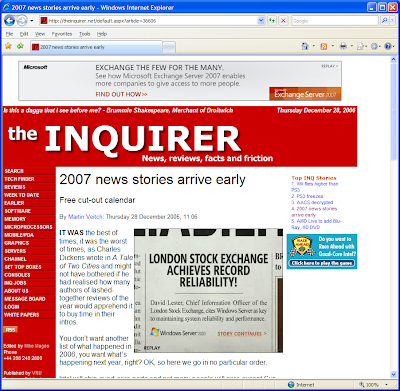 The first screenshot is IE7 with all ads in the article, and the second is Firefox 2 running with Adblock Plus and Filterset.G. As you can see above, the story is chock-a-block full of advertisements. One of them (about the London Stock Exchange), so typical of TheInquirer, fills the center part of the page such that it squeezes the text and distracts from reading the story. The Firefox rendering of the same page through AdBlock filtering is cleaner and a heck of a lot easier to read. But then I guess I'm unusual; I like to read my web pages instead of looking at 'pretty pictures'. As for the theme, who cares? That's why the theme is configurable (something that can't be said for Opera or IE). And RSS? RSS is a solution looking for a problem. Sorry, but if you go to the lead news sites (CNN and Google News, just to name two), you get all the 'aggregation' you need or can stand. In the end all RSS does is give you a link to go back and read the article anyway. Why not start at the beginning? I know, I know. I probably Don't Get It. Opera is a very close second. The only computer I own using Opera exclusively is the Nokia 770, and that's because it's bundled with the device. There are no other decent choices for the 770; but that's no problem since Opera works quite well in that environment. Why not use Opera everywhere? Because of an inability to install plugins, especially the two that make Firefox so useful to me. If I could get that feature, then there'd be no real difference between Firefox 2 and Opera 9. None whatsoever. It's IE7. The only reason I use IE7 is because I'm forced to by my bank. If I want to pay bills on-line with my bank I have to use IE. That means Windows. Period. No Firefox, no Opera. So I keep IE7 on my Windows system for when I absolutely have to use it. I don't go anywhere else on the web with IE7. I don't trust IE's security. It seems quite fast and stable, and I've had absolutely no problems testing it with many of the sites I normally visit (in spite of dire warnings about IE7 incompatibilities). I just don't trust IE's security out on the web. As so many are wont to yell at me, choice is good. And in this particular case it is. For Windows at least I have a choice (finally) between three excellent browsers. You can stick with the default if you upgrade to the latest version, or you can select between Firefox and Opera. For other environments, it's still good to have choices. My youngest daughter got a 17" iMac for Christmas (to use up at FSU), and tried to update her Facebook entry using Safari. For whatever reason Safari wasn't up to the task, so Megan went to the Firefox site and downloaded Firefox for Mac. A few minutes later she had it installed and had no more problems. She'll probably wind up like me on Windows; using Safari where she has to, and Firefox for everything else. And for Linux? For consistency sake I use Firefox. It behaves the same across Windows and Linux. Oh. Right now, Market Share shows IE with 80%, Firefox with 13%, and Safari with 4%. Both Firefox and Safari keep going up.